From using parts of the identity as large graphics, to pattern work and even to furniture, the identity remains consistent throughout. "Transcendent Material" gives the viewer a sense of what it would be like to completely immerse oneself in Donovan's work. 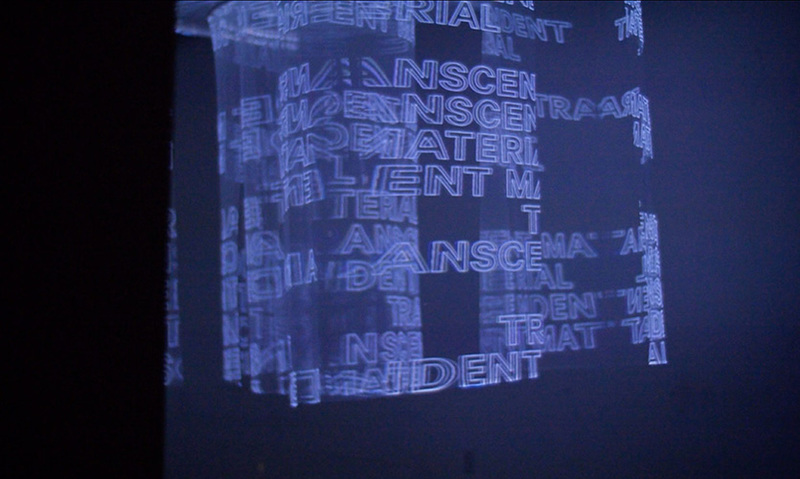 "Transcendent Material"uses projected typography to communicate the spirit of Donovan's works. 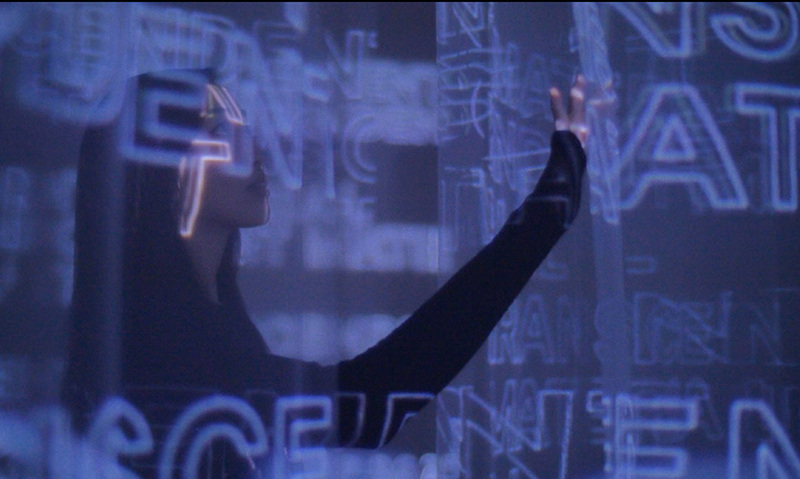 Teng built an environment using a mesh fabric that captures the light of the projector, but also leaves flexible room for users to glide between different panels of the fabric and distort the type. Poster art for the exhibition. An example of the extension of the building block identity work. Only upon closer examination does one realize how the layers of the piece are created. The Contemporary Craft Center is a place to both see and make art. The center emphasizes a hands-on approach to learning and creating—the same approach Art Center College of Design student Britteny Teng took when creating a visual language for her micro-exhibition. The assignment was to create an interactive installation to complement the exhibition of an artist’s work and distill the concept that the artist is trying to convey and reimagine it for others to not only enjoy the experience but to understand the process behind the artist’s vision. Teng chose to exhibit the work of Tara Donovan, who creates large organic sculptures from mundane, artificial materials. Donovan’s uses these materials to create immense representations of naturally occurring organisms, much like something seen under a microscope. Teng created a micro-exhibition that would be held at the Contemporary Craft Center (formerly the Craft and Folk Art Museum Los Angeles). The exhibition exhibits the works of Donovan throughout the museum, emphasizing her process of creating with her hands. The exhibition posters and materials abstract her works through typography highlighting her design philosophy. Donovan uses the notion of obsessive repetition to transcend the material itself and create massive sculptures that resemble what one might find under a microscope. Teng felt it was crucial for the piece to engulf the user in a form that visitors could lose themselves in. All Donovan’s works involve a transparent or translucent material because her use of light plays a huge role in how the audience perceives each piece. So, Teng built an environment using a mesh fabric that captures the light of the projector but also leaves flexible room for users to glide between different panels of the fabric and distort the type. closer examination does one realize how the layers of the piece are created. 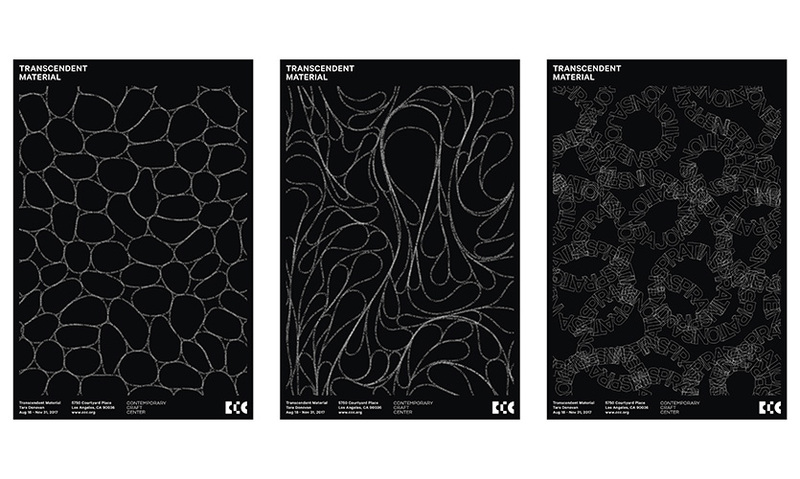 Transcendent Material is a micro-exhibition that was part of a much larger identity project for the Contemporary Craft Center. In addition to the identity of the institution, there was also identity collateral, tickets, six posters, a booklet for the exhibition, a website, outdoor furniture creation, a custom typeface and the installation itself. The building blocks that make up the mark represent the playful, collaborative environment of the exhibition. She focused on the materiality and color in every aspect of Donovan’s work. 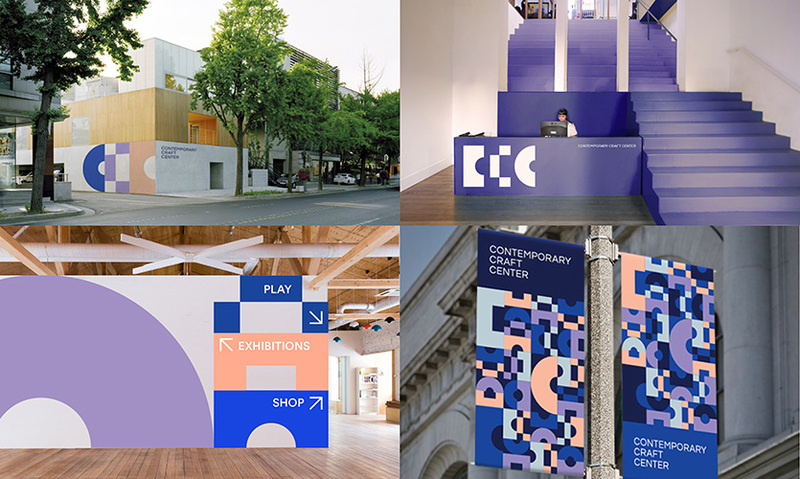 From using the blocks as large graphics that stand on their own, to pattern work, and even to furniture, the identity remains consistent throughout each medium. 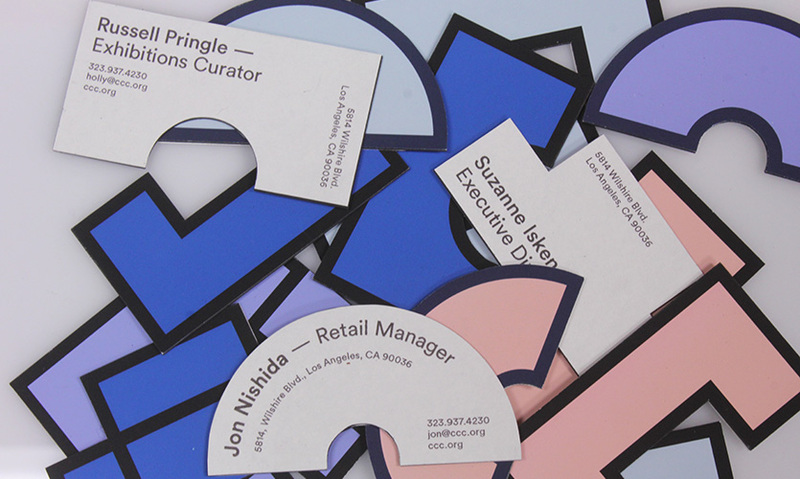 "Poetic and whimsical, this floating typographic micro exhibition is a sensory treat. Imagine stepping inside of words and meaning (if you can) while they dangle and float around you, and you’ll have some idea of the magic in this little project." 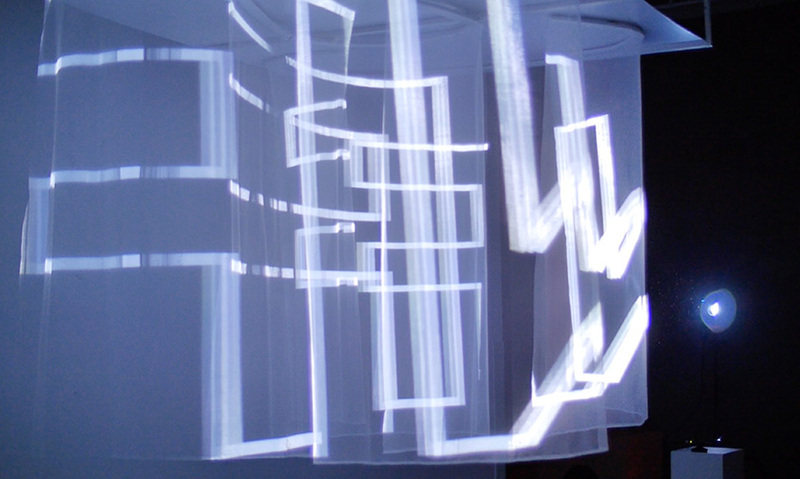 "I found the gauze, fabric projection portion of the project to be especially interesting. It brings the Craft Center's identity to life in a way that highlights the importance of immersive, light experiences within Donovan's sculptural work. While many students create museum identities, it can be difficult to demonstrate how the mock identities are flexible enough to translate and transform to ever-changing exhibition rotations. 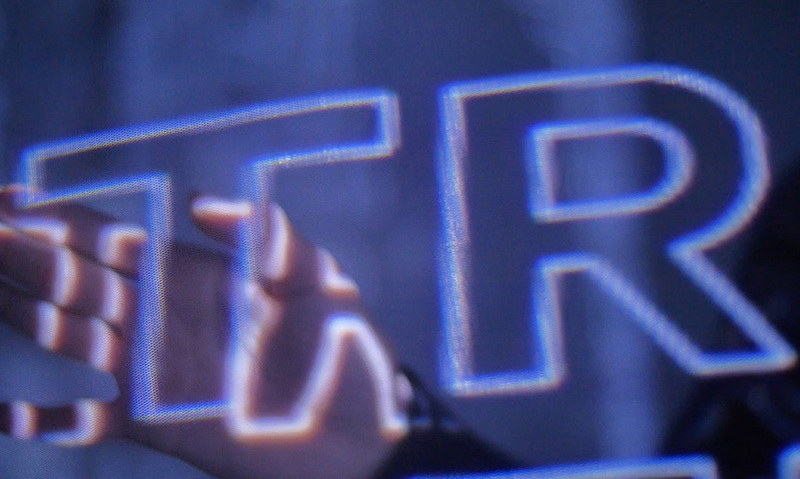 This student does a nice job of allowing the featured artist's work to influence the identity's application, and to physically create the projection piece shows a level of curiosity and experimentation that should be encouraged in student work."